The point of the lamington is to use up old sponge cake. Who in the hell has a heap of old cake lying around? No one. That’s why I neither like nor understand the lamington; the basic concept baffles me. In fact, I’d never even made a batch before this post. The point is, whether it makes sense or not, that is what a lamington is. I will defend to my death the authentic/traditional ‘Strayun lamington recipe as made perhaps not on its first occasion but ever after. Here’s how it goes- sponge cake, chocolate icing and dessicated coconut. I cannot stress this enough. It is integral to both the flavour and texture of the lamington. But recently, in trendy cafes and even, shock, horror, on food blogs (even ‘Strayun ones), I have come across furry, rather than fuzzy lamingtons – they have been using shredded coconut, not dessicated. For shame. In actual fact, my recipe is not even a recipe for lamingtons, it’s pretty much a recipe for icing. Because if the point of the lamington is to use up stale cake, you might as well just buy a sponge cake from the shops and be done with it. I did. Even so, this recipe is truer to form than the spiky, echidna-like lamingtons I’ve had the displeasure to witness in recent times. You may add whipped cream or some raspberry or strawberry jam in the centre of the lamington, no worries mate, but for God’s sake, stick to the tried and true recipe. Don’t mess with a good thing! After all, it is Australia Day. Sift the icing sugar and cocoa in a large heat proof bowl. Stir in the milk and add the butter. Over a simmering saucepan (double boiler) stir the mixture until the butter melts and you have a smooth icing. Set aside. Cut the sponge into even pieces with a sharp knife, I got 24 pieces in total. Coat the sponge with icing, letting the excess drip off, coat in coconut and leave to rest. See below for more details. Well done! I remember doing a lamington drive years ago. We used forks or wooden skewers to dip the lamingtons and had the coconut in a deep bowl with lots of coconut… that way you were able to gently ‘toss’ the cake around to coat it. Nicely done, thanks so much for sharing! I’m a fan of the jam and cream version also, I was just too lazy to make it this time around. Maybe next year? The one & only time I made lamingtons was in year 11 cooking class. Never been a huge fan. Does that make me unastrayan? No way! I don’t really like them either. Coconut is a savoury beast for me. I haven’t made lamingtons before and didn’t know that the coating was more of an icing mixture. I thought that it was covered in some sort of chocolate ganache. Great video and little tips on how to decorate the lamingtons. Yeah it is way less fanct then you’d think, hey. I love the video! Great to hear your voice! I must admit I am not a huge fan of Lamingtons… but I have only tried the store ones. I was looking for a traditional recipe to make and blog about, but did not find any “good ones” out there. Now I have one for next time! 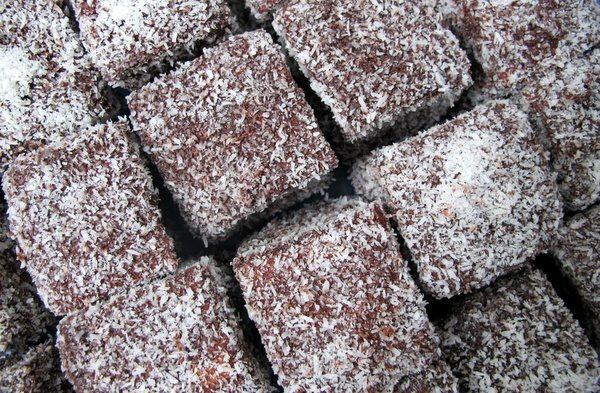 I love the idea and memory of lamingtons…remember the good old lamington drives back at school? These look lovely and just in time for Australia Day! Good advice about not messing with a lammington. I’ve had ones with some sort of fancy ones chocolate ganache on the outside. WHAT?! That is not a lammington! They were ordered for a work function and nearly everyone complained about them. I’m making lamingtons in the morning and I PROMISE I will use dessicated coconut. I have both but my dear husband was born an Aussie says dessicated is how it has to be. I’ve only been an Aussie for 6 years.. practically brand new. I agree with the dessicated coconut thing! But that being said, there are many other ‘Strayan’ things I would make before making Lamingtons – I haven’t ever made them. Maybe one day I’ll give them a go.